Sense Yourself. Sense Your Motion. Change Your Life. 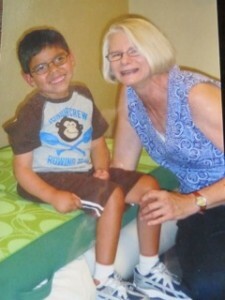 Senses in Motion specializes in the Anat Baniel Method (ABM) and offers treatment to adults and special needs children. Based in Grand Rapids, MI, Senses in Motion is led by Rene’ Manker. Learn more about services offered by Senses in Motion. The Anat Baniel Method is also a very effective treatment for adults with chronic pain, post-injury rehabilitation, brain injury, scoliosis, and stroke. Certified ABM practitioner Rene’ Manker believes we are born into this world as sensorimotor beings. We experience the world through our senses and we act on the world through movement. As babies we are driven to sense the world and begin to move toward or away from objects in our environment based on our experiences of safety and survival. Rene’ Manker is a certified Anat Baniel Method (ABM) practitioner, helping adults and special needs children improve movement through awareness. Senses in Motion provides experiences of movement that rewire the neuromuscular system, connecting the brain and body for greater ease of movement and function. It changes people’s lives! Awareness of movement is the key to improving movement. The sensory system is intimately related to the movement system. The purpose of sensation is to orient, guide, help control, coordinate and assess the success of a movement. Once you know what you are doing, you can change it to do what you want to do! Becoming aware of the harmony of the body allows you to move with awareness and intention. The focus of ABM is on education. It connects the body and brain through subtle, gentle movement experiences (movement lessons) that promote awareness of how to move. By helping a child sense how he is moving and by inviting him to experience small variations of that familiar movement, he learns new possibilities of movement that feel good and make sense to him resulting in better mobility, coordination, balance and function. ABM connects children and adults to their bodies to help them sense and organize themselves from the inside out rather than the outside in. Each session is called a Movement Lesson because the emphasis is on learning rather than exercise. You have to sense yourself in order to move yourself with intention. ABM — Access your brain to transform your life! For more information on Senses in Motion and Anat Baniel Method (ABM) treatment, click here. Senses in Motion specializes in Anat Baniel Method (ABM) therapy for special needs children and their parents.